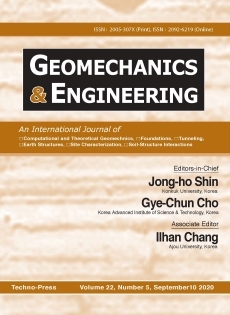 The Geomechanics and Engineering aims at opening an easy access to the valuable source of information and providing an excellent publication channel for the global community of researchers in the geomechanics and its applications. Dept Civil, Architectural & Environ. Eng. The spatial variation of ground motion in Kolkata Metropolitan District (KMD) has been estimated by generating synthetic ground motion considering the point source model coupled with site response analysis. The most vulnerable source was identified from regional seismotectonic map for an area of about 350 km radius around Kolkata. The rock level acceleration time histories at 121 borehole locations in Kolkata for the vulnerable source, Eocene Hinge Zone, due to maximum credible earthquake (MCE) moment magnitude 6.2 were generated by synthetic ground motion model. Soil investigation data of 121 boreholes were collected from the report of Soil Data Bank Project, Jadavpur University, Kolkata. Surface level ground motion parameters were determined using SHAKE2000 software. The results are presented in the form of peak ground acceleration (PGA) at rock level and ground surface, amplification factor, and the response spectra at the ground surface for frequency 1.5 Hz, 3 Hz, 5 Hz and 10 Hz and 5% damping ratio. Site response study shows higher PGA in comparison with rock level acceleration. Maximum amplification in some portion in KMD area is found to be as high as 3.0 times compared to rock level. synthetic ground motion; site response; time history; PGA; response spectra; amplification. This paper presents the results of analytical and numerical analyses of the effects of performing a pressuremeter test or driving a pile in clay. The geometry of the problem has been simplified by the assumptions of plane strain and axial symmetry. Pressuremeter testing or installation of driven piles has been modelled as an undrained expansion of a cylindrical cavity. Stresses, pore water pressures, and deformations are found by assuming that the clay behaves like normally consolidated modified Cam clay. Closed-form solutions are obtained which allow the determination of the principal effective stresses and the strains around the cavity. The analysis which indicates that the intermediate principal stress at critical state is not equal to the mean of the other two principal stresses, except when the clay is initially isotropically consolidated, also permits finding the limit expansion and excess pore water pressures by means of the Almansi finite strain approach. Results are compared with published data which were determined using finite element and finite difference methods. undrained cylindrical expansion; plane strain; modified Cam clay; stress-strain curves; analytical and numerical analyses; comparisons. Due to strong ground motion of earthquake, the material in the landslide can travel a significant distance from the source. A new landslide model called Multiplex Acceleration Model (MAM) has been proposed to interpret the mechanism of long run-out movement of this type of landslide, considering earthquake behaviors on slope and landslide materials. In previous study, this model was verified by a shaking table test. However, there is a scale limitation of shaking table test to investigate MAM in detail. Thus, numerical simulation was carried out in this study to validate MAM under full scale. A huge rock ejected and A truck threw upwards by seismic force during Wenchuan Earthquake (Ms. 8.0) was discussed based on the simulation results. The results indicate that collisions in P-phase of earthquake and trampoline effect are important behaviors to interpret the mechanism of long run-out and high velocity. The results show that MAM is acceptable and applicable. This paper presents the results of an experimental study on the effect of suction on compressibility and shear behaviour of unsaturated silty soil under various types of loading. A series of laboratory experiments were conducted in a double-walled triaxial cell on samples of a compacted silty soil. In the experiments the soil samples were subjected to isotropic consolidation followed by unloading and subsequent reloading under constant suction and prescribed overconsolidated ratio. The experimental results are presented in the context of an elasto-plastic model for unsaturated soil. The effects of suction on mechanical behaviour of unsaturated silty soil are presented and discussed. It is shown that increasing suction affects the shear behaviour of unsaturated soils, but there is a limit beyond which, further increase in suction will not result in any significant change in the behaviour. Soil foundations exhibit significant creeping deformation, which may result in excessive settlement and failure of superstructures. Based on the theory of viscoelasticity and fractional calculus, a fractional Kelvin-Voigt model is proposed to account for the time-dependent behavior of soil foundation under vertical line load. Analytical solution of settlements in the foundation was derived using Laplace transforms. The influence of the model parameters on the time-dependent settlement is studied through a parametric study. Results indicate that the settlement-time relationship can be accurately captured by varying values of the fractional order of differential operator and the coefficient of viscosity. In comparison with the classical Kelvin-Voigt model, the fractional model can provide a more accurate prediction of long-term settlements of soil foundation. The determination of influential distance also affects the calculation of settlements.